Transparency Market Research (TMR) observes that the global diabetic neuropathy market is competitive and fairly consolidated due to presence of strong players counting for the larger share. Some of the key players operating in the global diabetic neuropathy market includes Johnson & Johnson, Pfizer, Inc., NeuroMetrix, Inc., Boehringer Ingelheim GmbH, Astellas Pharma Inc., GlaxoSmithKline plc, Eli Lilly and Company, Depomed, Inc., Glenmark Pharmaceuticals Ltd, Lupin Limited, and Arbor Pharmaceuticals, LLC. Leading players are adopting the key strategies such as mergers, acquisitions, and partnerships which improved their product portfolio and helped them to expand their reach. Additionally, global players are increasingly investing their money on research and development (R&D) activities for introduction of new products. 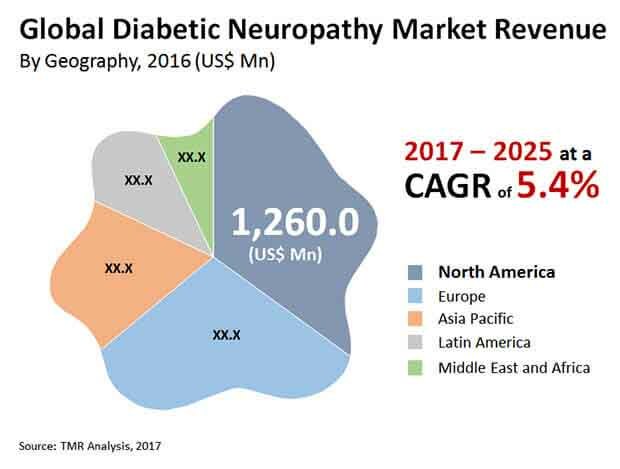 The global revenue of the diabetic neuropathy market was registered at US$3.6 bn in 2016 and expected to expand with a CAGR of 5.4% to attain the value of US$ 5.718 bn by the year 2024. On the basis of region, North America accounted for the leading share of revenue of around 34.9% of the overall market. This growth is attributable to presence of a large pool of diabetic patients and expensiveness of other therapies. North America was valued at US$ 1.071 bn in year 2016 and it is expected to expand with a growth rate of 5.3% CAGR over the forecast period from 2017 to 2025 to attain the value of US$ 1.68 bn by the end of 2025. Among the disorders type, proximal neuropathy is expected to witness growth with the highest CAGR of 5.7% over the forecast period. Diabetes is one of the metabolic disorder and most common problem found in nearly 30.3 mn people alone in the US which is nearly 9.4% of the US population. Among these amount of patients, about 60 to 70% of patients of diabetes have some issues in form of neuropathy. The diabetic neuropathies are some of the nerve disorders mainly caused by diabetes which can damage the nerves throughout the body. Prevention of diabetic neuropathies includes glucose control and lifestyle modification. Rising prevalence of the diseases are boosting need of the treatments on diabetic neuropathic which is likely to drive growth of the global diabetic neuropathy market. In addition, the factors like sedentary lifestyle and urbanization have led to change in the eating habits, and genetic composition is resulting in to increasing prevalence of obesity and numerous cardiovascular diseases. In order to reduce these occurrence numerous health organizations and governments are taking initiatives which is expected to boost growth of the global diabetic neuropathy market. For instance, National Institute of Neurological Disorders and Stroke (NINDS) are increasingly providing funds in research activities on neuropathy. Additionally, several Non-governmental organizations (NGOs) operating in the developing countries are taking some steps to control diabetes and withdraw symptoms of diabetic neuropathy. These initiatives are driving growth of the global diabetic neuropathy market. However, high cost of the treatment of neuropathy is expected to restrain growth of the global diabetic neuropathy market. Nevertheless, the growing number of healthcare awareness programs, and increasing investments in improving healthcare facilities mainly improving hospitals equipped with radiology devices to treat diabetic neuropathy, and a large pool of patients in the emerging countries such as India and China are creating lucrative opportunities to players in the global diabetic neuropathy market.